What eventually came to be known as The Vietnam War began in 1955 and ended twenty years later when Saigon “fell” to Communist North Vietnam and became known as Ho Chi Minh City. (In 2012 Vietnam is a unified Socialist-oriented free-market economy.) Vietnam was a a Cold-War era ‘hot button’ zone for the USSR and the USA. 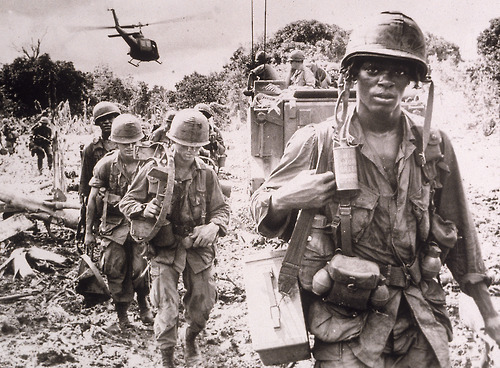 The U.S. sent soldiers in the early 1960s but American troupes did not become involved in combat until 1965 and by 1973 had withdrawn. Three million Vietnamese (from both sides) died, a million and a half Laotians and Cambodians, and close to 60,000 U.S. soldiers. It was not a war that could be “won”. as the sun rose against our faces. smelling his blood on the ground. glides by like a white moon. He won’t stay dead, dammit ! wounded by their beauty and war. ness. Anything with half a root or heart could grow in this lagoon. hands, as if snapping themselves in half, giving in to some law. dead things – each blossom a kiss from the unknown. this way – the stone lets me go. Go to the root of all things. You are sound and mathematical. Or split trench in a field of ragweed. Without going through you first. All poems (except “Reed Boat” and “Ode to the Maggot”) are from the poet’s 1988 collection, Dien Cai Dau.